Yesterday, visitors witnessed what could well be the first marriage proposal at The Real Mary King’s Close in over 400 years as visitor, Martin Spencer, chose the unique historic attraction to propose to his girlfriend Kim Scott. The couple who are both part of the Derbyshire Army Cadet Force met through work five years ago. Throughout their travels, Kim has always been fascinated with caves and underground venues, so when Martin made the decision to propose, he found the perfect setting in The Real Mary King’s Close. The proposal took place after the couple enjoyed a tour of the hidden city and was witnessed by fellow tour goers and The Close’s Robert Fergusson an 18th century poet who was their tour guide for the day. 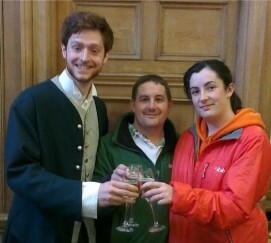 Many congratulations from all at The Real Mary King’s Close to the happy couple!